Very proud to be acknowledged as ‪‎leaders‬ (@newZorbas on Twitter) with our startup Hellene.gr + global social media community Zorba The Entrepreneur for Igniting ‪‎Hellenism‬! Follow the link below and share with friends or re-tweet! Those were all concepts which were single and standing alone they did not have a big chance for success. The second insight was: ALL BELONGS TOGETHER! And that was the key for me to create a new living and housing system including all the concepts and providing the INFRASTRUCTURE for the change to the better. (www.balance4yourlife.org) This new holistic living and housing concept can be adapted to your country or the concepts implemented to your villages and cities. One small part of the new education system is on the road, we just launched the website: www.netteachers.com. Hopefully, we manage this successfully and then bring to Greece ... These are concepts I am working on - also for YOU! I am so happy that the internet provides the opportunity to share my thoughts and work with you. If your friends Christiana, Sheridan and Stathis would not have shared their thoughts on the internet we would most probably not have met. 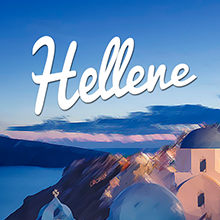 I love the "Hellene" concept and share and support as much as I can. And if everybody of us looks at his/her talents, potentials and opportunities and USE them, if we all stick together, trust each other and focus on building  the new by co-working and sharing we will succeed together. For a better today and a better,  sustainable and RESILIENT tomorrow for the future generation. You are not alone! Let's take care and action!